For many fish that are grown for aquaculture, the hatchery where they are born is located a significant distance from the place where they are ongrown to market size. Long distance transportation of juvenile fish is a challenge, be that via road, sea or air. It is expensive moving large volumes of water, so juvenile fish are transported at high densities, which has an effect on the water quality. Dissolved oxygen is rapidly depleted during respiration (which can be well managed using pure oxygen injection), and ammonia and CO2 accumulate as excreted metabolic waste products. It is important to understand how juvenile fish cope with acute exposure to ammonia and CO2 associated with live transportation for welfare purposes, and also to ensure they will grow normally at the new ongrowing site following their recovery from the journey. In the early days of NIWA's yellowtail kingfish juvenile production programme, a major hurdle was the transportation of juveniles to ongrowing operations. This fast-growing warm water species had a very high metabolic rate, and traditional live fish shipping technology (based on salmon) wasn't very effective at managing the large quantities of CO2 excreted during respiration. The high solubility of dissolved CO2 allows it to diffuse across the gills into the blood. When CO2 accumulates in the blood of fish, body tissues become acidified through the formation of carbonic acid causing a variety of physiological problems, including red blood cell swelling, loss of blood oxygen delivery capacity and reduced muscle and nerve performance. We wanted to know how well juvenile yellowtail kingfish coped with short term exposure to elevated dissolved CO2, so we performed a simulated transport experiment and measured various blood parameters related to physiological stress. 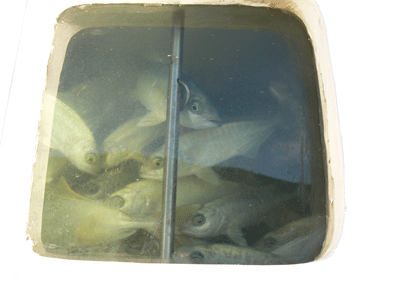 Loading the fish into the transport tanks is an important step in the transportation process. At this point the fish are the most stressed and water quality needs to be carefully monitored. After an hour the fish become accustomed to confinement and metabolic rate decreases substantially. In the first hour of transportation the dissolved CO2 concentration increases substantially (see graph below), until an equilibrium is reached between fish respiration and the CO2 degassing capacity of the transport system. Change in dissolved CO2 concentration during transportation of yellowtail kingfish juveniles. As has been observed from commercial transports, the juveniles coped well with the experimental transport, despite being exposed to relatively high CO2 concentrations. Commonly measured physiological stress indicators such as blood glucose and lactate levels, and muscle pH and lactate levels did not greatly vary between transported and control individuals during the simulated transport or subsequent recovery (see graph below). Comparison of physiological stress indicators for transported, non-transported and intensively exercised yellowtail kingfish. A second trial was undertaken to measure the effect of CO2 concentration on blood physiology. The blood is useful for studying the effects of elevated CO2 as it transports gases within the body and regulates the acidifying effects of CO2 by changing buffering capacity. Fish were exposed to three levels of CO2 for 5 hours. In addition, some fish were exercised intensively for a short time to gain insight into the scope for change in blood physiology. The degree of red blood cell swelling and blood haemoglobin concentration were measured. The more swollen a red blood cell and the lower the haemoglobin concentration, the more difficult it is for the fish to transport oxygen around the body. The above figure shows that after 5 hours exposure, the moderate and high CO2 concentrations caused a lowered haematocrit, indicative of red blood cell swelling. 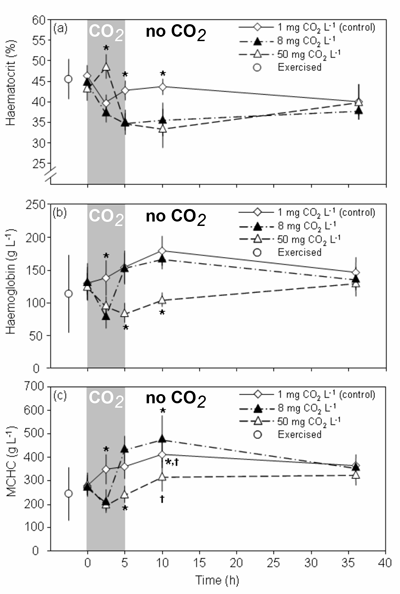 Mean cell haemoglobin concentration (MCHC) decreased mid-way through the simulated transport in the moderate and high CO2 concentrations, indicative of a reduced blood oxygen carrying capacity. The range of changes in blood physiology were broadly within the values for an intensively exercised fish. The juveniles appeared to be robust to the effects of acute CO2 exposure, and the effects of CO2 exposure were not evident 1.5 days after the simulated transport. The best part of live fish transport is the trip back with empty tanks and all fish successfully released into their new home. Yellowtail kingfish juveniles cope well with acute exposure to fluctuating and elevated CO2 concentrations. Moran, D., Wells, R.M.G., Pether, S.J., (2008). Low stress response exhibited by juvenile yellowtail kingfish (Seriola lalandi Valenciennes) exposed to hypercapnic conditions associated with transportation. Aquaculture Research, 39: 1399-1407. This research was funded by the NZ Foundation for Research Science and Technology, and was carried out during my employment at the NIWA Bream Bay Aquaculture Park. I was supported by a NZ Tertiary Education Commission Bright Futures Doctoral Scholarship.